I like the new workstation and webcam setup. I was able to record 2 hours of good video and compress it down to this. I will definitely keep up these types of videos. This entry was posted in How-To, Original Designs, Post-Iron, Pre-Iron and tagged bead sprite, beadsprite, beadsprites, How To, Pegboards, Perler, Perler Beads, time-lapse on January 17, 2014 by Danthol. This beadsprite is an Earth Elemental from Final Fantasy. You would run into these guys in front of chests in the Cavern of Earth (appropriately). I think I would have liked to have used a lighter shade of brown on this one to get a little closer to the source sprite, but overall, it came out well. I like all of the empty spaces between and the effect of being able to see whatever is in the background through it. This one will look really cool next to the palette swapped fire elemental that uses purple and reds. This entry was posted in Final Fantasy, Nintendo, Perler beads, Pre-Iron, Video Games and tagged 8-bit, bead sprite, beadsprite, beadsprites, Final Fantasy, NES, Nintendo, Perler, Perler Beads, video game characters on November 11, 2013 by Danthol. New Masking Tape Tutorial: Super quick hole punching technique and detailed ironing walk-thru. This is the latest in a series of tutorials for building and ironing perler bead creations. There is a focus on the ironing as well as a new method for poking holes. The song in the beginning is written by me, and the other two songs by Silent Partner and Topher Mohr and Alex Elena. What other tutorials should I make? This entry was posted in Final Fantasy, How-To, Nintendo, Organization, Perler beads, Post-Iron, Pre-Iron, Video Games and tagged 8-bit, bead sprite, beadsprite, beadsprites, Final Fantasy, Fuse, fusing, Ironing, NES, Nintendo, Pegboards, Perler, Perler Beads, pop-culture, video game characters on November 1, 2013 by Danthol. Getting a little behind in my fusing. Last few days have been super busy. I have had time to put stuff together, tape it up, poke them holes, but not enough time to iron them out. I’m gonna be getting these done later tonight, and maybe even make some of my first few webcomics! I have a new domain that I will talk about in a few posts, and am working on a whole new project with all of the characters, and most of the set pieces will be made with perler beads. I’m really looking forward to make this idea I have had in the last month into a reality. I don’t know how well the mixed media format of a webcomic, mixed with photography, mixed with a craft art, mixed with videogame culture, mixed with my sense of humor will work, but I intend to put my best foot forward. Also, I have a time lapse video going on youtube later this week, a new tutorial in the works, and a few other surprises! Stay tuned! This entry was posted in Final Fantasy, Nintendo, Perler beads, Pre-Iron, Video Games and tagged 8-bit, bead sprite, beadsprite, beadsprites, Final Fantasy, Fuse, Ironing, NES, Nintendo, Perler, Perler Beads, video game characters on October 16, 2013 by Danthol. New tutorials now on YouTube! I’ve finished my first set of tutorials using my masking tape method for beadsprites, and posted the HD videos on YouTube! You can see the videos in the links below. Enjoy and post in the comments here, and on YouTube. This entry was posted in Arcade, Equipment, How-To, Perler beads, Pre-Iron, Video Games and tagged Arcade, beadsprites, Fuse, Ironing, Pegboards, Perler, Perler Beads, pop-culture, video game characters on August 22, 2013 by Danthol. Transporting from one location to another. If you are just moving a board that you have made from one room to another, you just have to be careful as you walk. If you need to move them longer distances, I have found that it works really well if you take a second board, line it up on the top, and tape it down with masking tape. I start by taking one corner, taping the top, and then sliding it to the edge of the table and taping underneath, and rotating it 180 and getting the diagonal corner, and then just repeating until it is secure. When they are solid like this, you can even transport them vertically. When you get to the place you will be fusing them, you can just cut it with an exacto knife. This entry was posted in Equipment, How-To, Organization, Perler beads, Pre-Iron and tagged 8-bit, How To, Pegboards, Perler, Perler Beads, Pre-iron, Quick Tips on July 25, 2013 by Danthol. Flying Piranha Plant from Super Mario Bros 3. My favorite part of this is the colors. I know it’s not the most impressive thing in the game, but it was easy to make, and I had just made a Peashooter from Plants Vs Zombies, so I thought I would stick with the theme. SMB3 on the original NES was the pinnacle of console gaming back in the day. I didn’t have my own NES at the time, so when it came out, I spent the night at a friends house, and we rented an NES and this game and stayed up all night beating it. This game really set the standards for all Mario games to come. This entry was posted in Nintendo, Post-Iron, Pre-Iron, Video Games and tagged 8-bit, beadsprite, beadsprites, NES, Nintendo, Perler, Perler Beads, video game characters on July 25, 2013 by Danthol. Plants Vs Zombies Pea Shooter. This is the first request from my son. He loves PvZ. He is really hyped for PvZ 2 to come out, and I’m sure he will put another 100 hours into that game, too. I really like the fuse on this one; both sides look awesome. He has it on his wall now, and loves it! This entry was posted in Perler beads, Post-Iron, Pre-Iron and tagged 8-bit, beadsprite, beadsprites, Perler, Perler Beads, Popcap, video game characters on July 25, 2013 by Danthol. Donkey Kong Jr and Space invaders. I’m already running perilously low on black Perler beads, so I decided that I would find some easy designs that didn’t take any black beads. 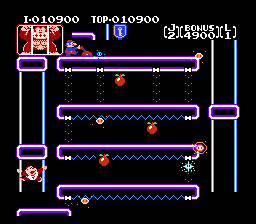 I always loved the Donkey Kong Jr game. In the 80’s, you could count on the game sequels in the arcades to not stray too far from what the original game did. The Shakey’s Pizza had DK Jr, and I played it quite a bit; I could always get to, but never quite beat the electricity level. Space Invaders was a no-brainer. I will likely make dozens of these, as they are good space fillers on boards that I have to tape up to bring them home. This was the first game that I ever stayed up past midnight to play, and wake up first thing in the morning to play again. My father had an Atari 2600, and would let me play anytime I was at his place and he wasn’t already watching the TV. This entry was posted in Nintendo, Perler beads, Post-Iron, Pre-Iron, Video Games and tagged 8-bit, Arcade, Atari 2600, beadsprite, beadsprites, Nintendo, Pegboards, Perler, video game characters on July 25, 2013 by Danthol. I got a request from a co-worker to make the Megaman for him, and I had a little more room on the board for the fairy that refills your health in Zelda. The fuse on the Megaman came out nice. I don’t see many other people melt them to the extremes that I go to, but I think I will move forward with the heat and pressure that I am using on the one side, but no fuse at all on the opposite side. My goal is to have almost no visible holes on the main side, aside from those on the borders. What is your opinion on fusion and how far to go? This entry was posted in Nintendo, Perler beads, Post-Iron, Pre-Iron, Video Games and tagged 8-bit, beadsprite, beadsprites, Capcom, NES, Nintendo, Pegboards, Perler, Perler Beads, video game characters on July 25, 2013 by Danthol.